Engines using town gas were first developed by the Dowson Company, Westerham, Kent, in about 1876. Several other companies became active in this field, including Crossley, National, Andrews and Hornsby, but large engines were also imported from Belgium. The engines in the smaller range were principally used for workshop drives and for farm power sources. The higher-powered engines were generally for industrial processes, some of the biggest being run on blast-furnace gas; their function was to generate electricity and to provide air blast for the furnaces. Those installed in the Stavely iron works in 1906 have only recently been superceded. In the past the gas engine held a considerable advantage over steam in that it did not require a boiler and therefore occupied less space. Some of the early engines ran on producer gas which was cheap. However, they had the disadvantage of requiring highly skilled attendance and maintenance. They remained popular until about the 1920s when the wider electricity grid made electric power more economical. The gas engines in the photograph were built by Hornsby in 1908 and 1911. They were rated at 49 bhp and 37 bhp respectively; both have an 11½-in bore and 18-in stroke. 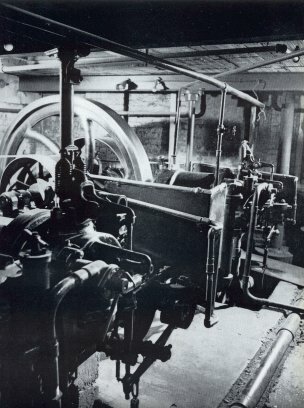 The latter engine was supplied for driving printing machinery and had a heavier electric-lighting-type flywheel of about 3 tons, the smaller flywheel being 2½ tons. These machines were virtually the end of the series since production ceased about 1912. The two machines were adapted to their present use and location in the Hibberd Bros. factory in 1929, where they were synchronized and drove the joinery machinery in the plant. Today one engine is in daily use driving about three-quarters of all the machinery (the remainder is electrically powered). The other engine is kept for standby purposes. Town gas supplies are used, the gas passing through an anti-fluctuator to maintain a steady pressure. Oil pots are located on the cylinder and big end, and water for cooling is pumped from a natural well 30 ft underground. Update in October 2010: the Greater London Industrial Archaeology Society database puts the Hibberd Brothers factory at 66 Meadow Road rather than Dorset Road. It seems more than likely that it was behind Meadow Road in the premises accessed by gates a few houses along from No 66. The building is now occupied by a different company and it would seem likely the gas engines are long gone.